NO FUSS. NO MESS. NO NOISE. What do we mean by no fuss, no mess, no noise? Well this ultra-cool looking range actually CLIPS together. So, when it comes time to camp, fish, picnic or road trip just grab the bundle and go. No mess refers to when you’ve had your saucy food and you can’t or don’t want to wash up there and then. Just clip a clean dish on top and load in the dishwasher at home. The no noise part is a WandsPro® favourite. No more rattling in your bag, car or camp box. ClipCroc® CLIPS! It’s that simple. We use a light density, hard wearing, food grade Polypropylene that gives you durable crockery but without the weight. Perfect for any backpack, picnic, caravan or hike! A smart base design, ensuring your crockery stays put, whether in your hand or on any surface. Our innovative clip-together design ensures your crockery is safely and securely stacked and free from falling whether on a boat, RV, caravan or 4×4! Our unique and innovative design is a World’s first. We hope you love the design and all the features the range has to offer. Our unique design brings to life an anti-rattle, stress reducing feature ensuring your journey is travelled in peace and quiet. You decide a convenient time to clean your dishes. Clip your crockery together, contain the mess, and save the washing up for later. A simply brilliant method to reduce heat transfer to your lap or hands. The air space between two ClipCroc® provides great insulation. We only use Food Grade Polypropylene that’s FDA approved, BPA free and dishwasher, freezer and microwave safe. ClipCroc® Bowl. Available in colours: Ice White, Midnight Black, Sky Blue. The brand new ClipCroc® Bowl is the most advanced and feature-packed outdoor bowl ever created and has been specifically designed with optimal width to depth ratio for practical user experience. 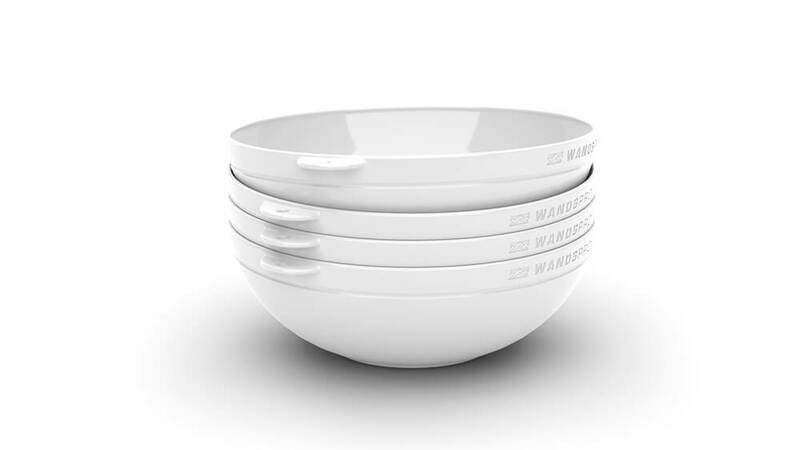 With convenient high sides, the bowl is ideally suited for meals such as cereal, soup and noodles. The space efficient, low profile design is perfect for compact stacking for virtually any occasion inside or out with a stack of 4 bowls measuring only 9 cm high. Bowls clip together securely with a gentle snap, and release by pulling either at the tabs or around the circumference of the bowl. The bowl and dish have the same circumferential clipping mechanism. ClipCroc® Dish. Available in colours: Ice White, Midnight Black, Sky Blue. The brand new ClipCroc® Dish is the most advanced and feature-packed outdoor dish ever created and has been specifically designed to contain food and assist the eating experience in rougher environments. The side walls are higher than the plate and orient to vertical to contain your meal more effectively. Ideal for more exploration and outward bound activities, this dish is perfect for one handed use or occasions where standing is necessary or where there are limited flat surfaces to eat from. A stack of 4 dishes are just 5 cm high. Dishes lock together with a gentle snap and release with a simple pull of the tabs or around the circumference of the dish. The dish and bowl have the same circumferential clipping mechanism. ClipCroc® Plate. Available in colours: Ice White, Midnight Black, Sky Blue. The brand new ClipCroc® Plate is the most advanced and feature-packed outdoor plate ever created and has been specifically designed with perfect dimensions ensuring no compromise on portion size. Due to the low-profile design, the plate is extremely space efficient with compact stacking. 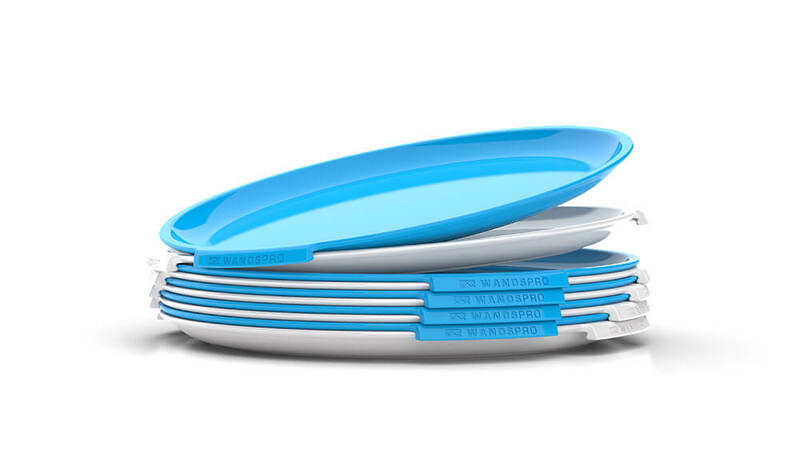 A stack of 4 plates is just 3 cm high, therefore ideal for caravans and motorhomes or eating from a table where a conventional plate shape is preferential. The unbelievably easy clipping mechanism secures together with a simple squeeze of the plates and releases just as effortlessly by using the side tabs or at any point around the circumference of the plate. The world's first range of clip together crockery utilises our unique and distinctive 'ClipLip technology' which assists with our goal in designing both a functional and aesthetically pleasing product. We believe in outstanding design where we refuse to compromise on form or function in any range we create. ClipCroc® comes in three distinctive and complimentary colours including Ice White, Midnight Black and Sky Blue. Stay classic with a clean and crisp white set, go gourmet with our jet black option, stylish blue to make your mealtimes pop or get creative with your own super stylish combinations.